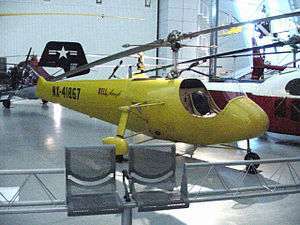 The Bell Model 30 was the prototype for the first commercial helicopter, and the first helicopter built by Bell Aircraft Company. Designed by Arthur M. Young, the type served as a demonstration test bed for the successful Model 47. Young had experimented with helicopter designs, mainly using scale models, and in 1941 he approached the Bell Aircraft Corporation in Buffalo, New York. The company agreed to build a number of full-scale prototypes, and Young moved to Buffalo. With the main Bell factories immersed in war production, and to ensure a research and development program that was sufficiently private and free of distractions, Young and his team moved to the Buffalo suburb of Gardenville (West Seneca). The Ship 1 prototype's first serious mishap occurred near the very end of 1942 in captive testing, when a Bell corporate pilot asked to try the Ship 1, while not using a seat belt and hanging onto the controls instead to stay in the open cockpit - this captive flight attempt resulted in the rotor system "going through resonance" as designer Arthur Young had warned about, resulting in a "bucking" instability and accident which cracked the rotor blades loose. The first free flight of Ship 1 was carried out on June 26, 1943, only the third American helicopter to fly. The Ship 1 prototype registration NX41860 had an open cockpit, an enclosed fuselage for the Franklin piston engine, and a fixed three-wheel landing gear. The engine drove a two-bladed main rotor and a two-bladed anti-torque tail rotor. The prototype crashed in September 1943 and was subsequently modified with several improvements, including an enclosed cabin for the pilot and passenger, who sat side by side in the cockpit. With all the lessons learned, the third prototype became the basis for the production model, the Bell Model 47. The Model 30 Ship 1A, Genevieve, is now on display at the Steven F. Udvar-Hazy Center of the Smithsonian Air and Space Museum. (c/n 1) The original Bell 30, built with an open frame tubular steel framework with an open cockpit and four widely splayed undercarriage legs with skids at the ends, made from 3 in (76 mm) Aluminium alloy tubing. First flown on 29 December 1942, test flying continued until a serious crash in September 1943. (c/n 1A) Ship No.1, re-built after the crash with a strutted tricycle undercarriage with nosewheel, and semi-enclosed cockpit, re-joined the test programme by March 1944. (c/n 2) The second aircraft was built with a new three wheeled undercarriage, semi-monocoque fuselage, new tail rotor mounting and fully enclosed cockpit for pilot and passenger. (c/n 3) The third aircraft was built with a triangular section welded tubular steel tail boom, four-wheeled undercarriage, full set of instruments, but a completely open cockpit. Performance and handling of this aircraft was found to be much better than its predecessors but the open cockpit was viewed as a major handicap. The solution to the open cockpit was the plexiglas bubble that was to become iconic on the Bell 47/H-13 production aircraft. Ship No.1A is on display at the National Air and Space Museum and Ship No.3 is owned by Buffalo History Museum. 1 2 3 4 5 The Illustrated Encyclopedia of Aircraft (Part Work 1982-1985). Orbis Publishing. ↑ Helicopter Pioneers- first Bell Flight Testing (YouTube). Gardenville, NY: burgesco1. 1943. Event occurs at 4:40. Archived from the original (YouTube) on July 29, 2009. Retrieved July 25, 2015. ↑ "Bell 30". kamov.net. Retrieved May 9, 2012. 1 2 "American airplanes:Bell". www.aerofiles.com. 20 April 2009. Archived from the original on 2 January 2010. Retrieved 2009-12-23. ↑ Pelletier, Alain J. (1992). Bell Aircraft since 1935. Annapolis: Naval Institute Press for Putnam Aeronautical Books Limited. pp. 55–58. ISBN 1-55750-056--8. The Illustrated Encyclopedia of Aircraft (Part Work 1982-1985). Orbis Publishing. Pelletier, Alain J. (1992). Bell Aircraft since 1935. Annapolis: Naval Institute Press for Putnam Aeronautical Books Limited. pp. 55–58. ISBN 1-55750-056--8. "American airplanes:Bell". www.aerofiles.com. 20 April 2009. Archived from the original on 2 January 2010. Retrieved 2009-12-23. Wikimedia Commons has media related to Bell 30. Stabilizing Device on Tail Keeps Rotor Horizontal August 1944 article on Bell 30. Photo at bottom of page. This article is issued from Wikipedia - version of the 10/21/2016. The text is available under the Creative Commons Attribution/Share Alike but additional terms may apply for the media files.